A very entertaining story! I stopped counting the times I chuckled out loud. The time Ali and Luke were on the dock with a bottle of scotch. The time Jack (firefighter) eyeballs Luke and says a guy who is making out with Leah has a record. He's searched his background - the guy has a library fine, for goodness sake. Hmm can see where Jack is heading! Then there is the time Luke and Sawyer stake out a house and get more than an eyeful in a TMI kind of way. Luke and Ali are very likeable characters and sizzle when together. Luke is a tough cop with a heart of gold who has trouble allowing people into his life and letting them love him. Ali's values are stability, security and safety. She works hard at being strong, independent and positive. She is well loved by many of the old folk in town. She is used to men letting her down, will Luke do the same and break her heart as well? The story is well paced, with endearing characters and well... it was plain fun to read. Glimpses of a few Lucky Harbor locals happen - Lucille is still on Facebook. In one of the previous books this Facebook page seemed so real I was tempted to see if it was actually there! Did I look? Sh! Not owning up to anything. The next book is set up for the story of Jack and Leah, looking forward to it already. Hope you will try the series. Some of them I liked better than others, but all good reading. I love books that make me laugh out loud. I am probably one of the few to not have read Shalvis! This book in the series was particularly funny, although they are all full of humour. 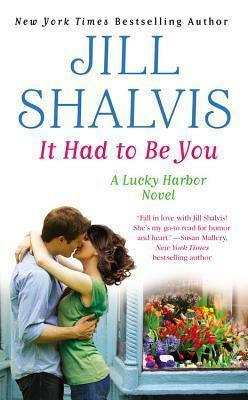 I never read Jill Shalvis until I heard many of the fans of Susan E Phillips raving about Jill's books.